For all your decorating needs, call an expert with the experience and expertise to get it right first time. Whatever the size, style or complexity, you can rely on any of our Painters and Decorators to get the job done, quickly and economically. Wallpapering, stencilling, patterned painting and preliminary preparations are all part of their service to you. Whether you have something in mind to begin with or need some advice in the best way to decorate your home, all be happy to help. Interior or exterior, all fully qualified Painters and Decorators will carry out the job to your exact requirements, using the right tools for the perfect finish and colour. Many work anywhere across, Devon, Cornwall and Somerset, and offer a full consultancy service to ensure that you are 100% happy. Call now for a quote. Just choose the right company for your needs in your local area- its as simple as that! Rearrange The Furniture- Pull your furniture away from the walls. Try positioning it at intriguing angles. For example, a sofa arranged diagonally across a narrow living room will make the room look wider. Bring In Plants- Greenery always adds a breath of fresh air to a room. If you don't have a green thumb, try silk plants and trees. The quality has gotten so good that its hard to distinguish them from the real thing. Lay An Area Rug- An area rug is a wonderful way of defining a conversation area. Try one that complements the room. Lay it at an angle beneath your coffee table. Hang Pictures or Mirror- Hang pictures that reflect your personality. Try frames that are more ornate. When hanging a mirror, try and position it so that it reflects and nice view or an interesting architectural element. Group Figurines- Pull out your favourite collectibles. Show off your personality. Find a display area and group related objects together, in sets of three or five. Try and vary the shapes. Add Decorative Pillows- The good news about decorative pillows is that they are an easy way to add textures and patterns to a room. Still better, they can be changed to jazz up a sofa or chair before your room is ready for a major makeover. 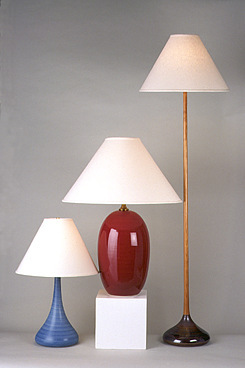 Replace Lamps- Lamps are probably the one thing in your home that will give others a clue that your room is outdated. Seek out new and fresh lamps that make a statement. Add A Throw Or Afghan- Similar to decorative pillows, throws and afghans add texture to your furniture. They come in all kinds of natural and man made fabrics. Find a pattern and style that you like. Eliminate Clutter- Clutter has a way of eliminating the desired mood and effect of any room. Find storage spaces for papers, toys, and other items that take from the personality of a room.